Best class -- The IUPUI Community Learning Network offers scads of great classes, but my favorite this year was the Immersion Spanish Institute, taught by Amy Bomke-Keating. The class, which runs for a full week, offers almost 40 hours of intense Spanish instruction, and yet it manages to be fun and engaging. Now, I can finally hold a conversation in Spanish, instead of just asking where the bathroom is. Best continuing education venue -- This year's undisputed winner is the IU Mini University program, hands down one of the best educational experiences of my life. In a single week, I learned about piracy, Shakespeare, great hoaxes, the history of puzzles and so much more. It's summer camp for grown-ups, and I can't wait until next year! Best instructor -- Instead of honoring an individual teacher, this year's award goes to the entire "cast" of Conner Prairie's annual Conner Prairie by Candlelight event. As participants travel from house to house in the pioneer village, these actors tell stories of their families' holiday traditions. They're always ready with answers to guests' questions, and they do a wonderful job of fostering holiday spirit. This year, my husband and I stood out in the cold on purpose, just to sing a few more carols with these skilled "pioneers." Strangest class topic -- The Eiteljorg Museum wins again, this time for a birch-biting workshop with artist-in-residence Kelly Church. The gist of the class: Create designs (such as turtles, butterflies and dragonflies) in birch bark ... with your teeth. It may be an artistic tradition, but to me it sounds pretty unsanitary. Just as they do at the Academy Awards, let's take a moment to remember the losses in our educational family this year. The most difficult is the death of Joseph Allford, who taught at Frasier's Gourmet Foods and took home last year's award for best class. I think of him every time I scrape a vanilla bean or make raspberry fool with his recipe. The other loss is the closing of Lawrence Township Community Education, where I learned to read tarot cards, make mosaics, and cook the world's best biscuits. I'm going to miss this venue's eclectic mix of inexpensive classes. Finally, I owe a thank you to the thousands of readers who have made this blog so successful. Here's to another exciting, educational year! Sure, you'd like to re-use Grandma's favorite chair, but the brown-and-mustard plaid upholstery just doesn't work with your decor. Or, maybe you want to refurbish that unique thrift-store find. Either way, Shelly Leer, owner of Flipt Studio, has a class for you. Mondays: Jan. 11 - Feb. 22, 7-9 p.m.
Tuesdays: Jan. 12 - Feb. 23, 1-3 p.m.
Wednesdays: Jan. 13 - Feb. 24, 7-9 p.m.
Thursdays: Jan. 14 - Feb. 25, 1-3 p.m.
Or, try a one-day workshop on sewing basics (Jan. 16) or pillow-making (Jan. 30). Classes run from 10 a.m. to noon and cost $45. E-mail Shelly to register for any of these classes, and you'll learn to make something new from something old. Grandma would approve. The December issue of Indianapolis Monthly includes an article on Joseph Allford, the pastry chef and cooking teacher who died earlier this year. One of Allford's classes at Frasier's Gourmet Foods took home our Best of Indy award last year, and I had looked forward to taking many more of his classes. Last night we enjoyed another wonderful experience at Conner Prairie by Candlelight. In 1836 Prairietown, we learned about historical holiday traditions, sang carols, and snacked on cookies and hot chocolate. It's truly a magical experience, and it's the perfect reminder of the true meaning of Christmas. The virgin Mary decorated with elephant dung. Crucifixes submerged in jars of urine. This Sunday, a lecture at the IMA will explore the power -- and cultural impact -- of such blasphemous art. The lecturer is S. Brent Rodriguez Plate, author of Blasphemy: Art That Offends. The book includes images of the most notorious blasphemous art of our time -- probably not your best choice for a holiday stocking stuffer. The lecture takes place at 2:30 p.m. Sunday. The event is free, but registration is required. 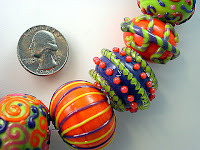 Black Friday may be over, but Boca Loca Beads is still offering discounts! The introductory crash course in lampworking, which runs from 10 a.m. to 6 p.m. this Sunday, will cost you just $100. You'll learn about safety procedures and lampworking tools before getting started on your own projects. Boca Loca bills it as "a perfect way to get started in the magical world of melting glass." Boca Loca is also holding a holiday open house from 10 a.m. to 6 p.m. this Saturday. You'll find demonstrations, make-it-take-it projects and some yummy holiday goodies.